Summary: The banking industry ranks 8th in terms of its adoption and investment in AI, yet areas such as fraud detection are growing. An AI update for community banks. Did you hear about the hunter that was struck on the head by a falling Canadian goose? The hunter was actually knocked unconscious and suffered head and facial injuries. In case you were wondering, it wasn't karma. 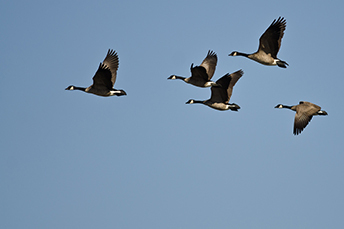 Apparently, a nearby hunter fired into a flock of geese overhead, killing one of them. That goose then fell some 90 feet and struck the other hunter on the head. For the non-hunters in the crowd, you can stop laughing now, and for the hunters out there, you might want to buy a helmet. In our industry, it seems at least some small flocks of banks are flying around when it comes to embracing the capabilities of artificial intelligence (AI). To help you get a better handle here, we discuss the findings of a BAI report entitled "AI in Banking: New Frontiers in Customer Experience". It found that 76% of business leaders view AI as critical to the success of their company's strategy. In addition, companies that have already begun using AI tools, or that plan to add them in the near future, say they expect AI to boost their revenue by 40% by 2020. That's right, just 2Ys from now. If you may be thinking those are huge percentages and a very short timeline, you would be correct. That is, until you consider that AI has been around for over 70Ys. Sure it has picked up steam recently as technology has advanced, but also interesting. Yet, while roughly 50% of financial institutions with > $50B in assets have launched at least one AI solution, of the 10 major industries within the study, the banking industry ranks 8th in terms of its adoption and investment in AI. You might be further surprised to hear this given the surge recently in discussions around robo-advisors and chatbots to assist customers. Heck, you don't even have to look very far to surface the next announcement of a large bank using digital assistants such as Alexa to give customers the power to move money between accounts or pay bills with their voice. Diving deeper into the survey, it appears bankers have been slow due to fear of change among employees (54%) and fear that adoption of AI will lead to redundancies (25%). For banks that have yet to start thinking about AI, it could be something to add to your strategic discussions in the next few years at least. After all, customers and delivery channels are changing, so banks may need to change too. Finally, the survey found community banks and credit unions have been the slowest to embrace AI and significantly lag their larger peers. The main areas where AI has been put to use so far by banks and financial service companies are security and risk applications. Beyond security, the next most popular way banks have begun using AI is through tools and applications that allow them to personalize interactions with customers. Given the potential future impact of AI in and around banking, particularly in such areas as fraud detection, it is important to at least start thinking about this for down the road. Oh, and as you begin to do so, don't forget to look up once in a while to avoid any potential geese that might fall from the sky. 1) Medina Savings and Loan Association ($54mm, NY) will merge with and into Generations Bank ($292mm, NY) for fair value as determined by a third-party appraisal. The transaction is structured as a merger with a mutual entity. 2) United Bank of Iowa ($1.5B, IA) will acquire First Trust & Savings Bank ($38mm, IA) for an undisclosed sum. 3) Recently formed Stark Bancshares Inc. (MO) will acquire Farmers State Bank ($63mm, MO) for an undisclosed sum. CNBC reports Amazon is looking for bank partners to target younger customers with a checking account-like service soon. Amazon hopes to cross-sell their Prime membership to bank customers to grow that business. JP Morgan is reportedly one of the banks being considered. JPMorgan said it is optimistic about this year and boosted its return on tangible common equity (ROCE) projections over the next 3Ys due to better economic growth and the positive impact of the new tax law. The #1 reason why a bank would partner with a fintech provider, according to an ICBA survey, is to attract customers and improve customer experience. The other considerations were: increase fee income; reduce risk and fraud; and improve efficiency/reduce cost. New Fed Chairman Powell told the Senate Banking Committee that low oil prices, a strong dollar and the growth of e-commerce have contributed to low inflation over the past few years. He called low inflation a global phenomenon and indicated the impact of Amazon, global slack and other potential factors could be primary drivers. According to a LendEDU survey, around 45% of respondents were open to using Amazon as their primary banking account, while about 50% felt comfortable using a savings account created by the company.